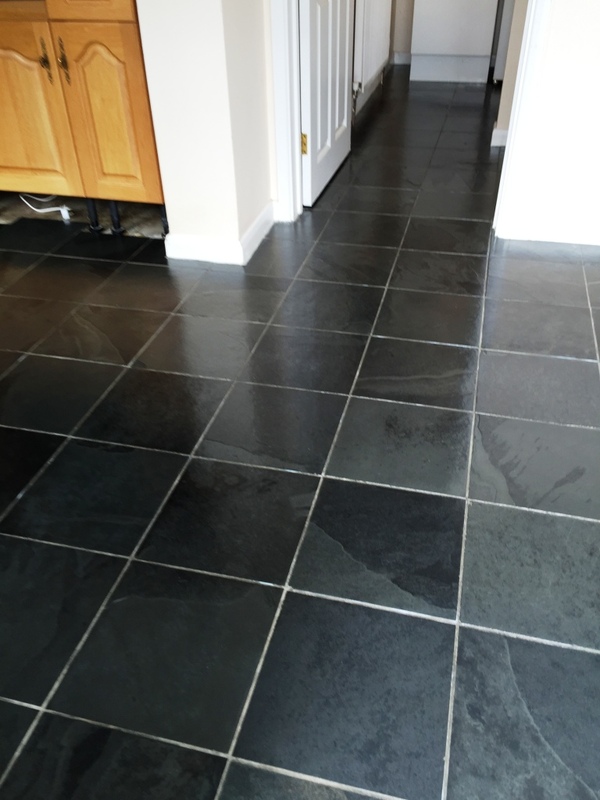 While Slate is typically known for its durability, any kind of porous stone will over time become dirty and stained if the sealer is not maintained, sealers do fail eventually and usually in the highest traffic areas first where they become worn down the most. Before starting the cleaning process, we protected the walls and skirting boards from coming into contact with products by covering them with plastic. I also opted to remove the kickboards from around the edges of the kitchen units, kickboards are usually just clipped into place and are easily put back later. 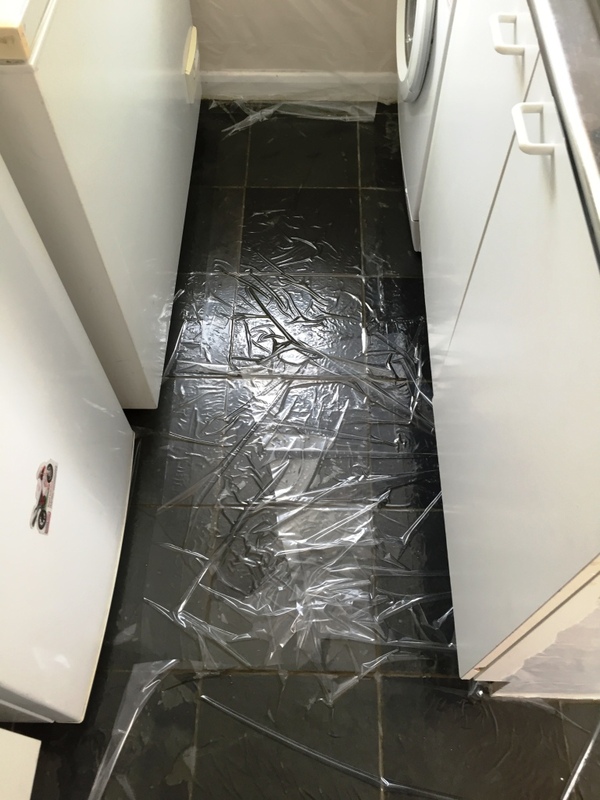 I then applied Tile Doctor Remove and Go to the floor, which is a multi-purpose stripper/cleaner designed to strip away old sealers and remove grout haze, adhesives and paints. It also draws out ingrained stains. The entire floor was blanketed in a thin plastic sheet to give the chemical time to emulsify the old sealers without drying out. Next, I used our high-pressure extraction system to remove all the emulsified sealers. 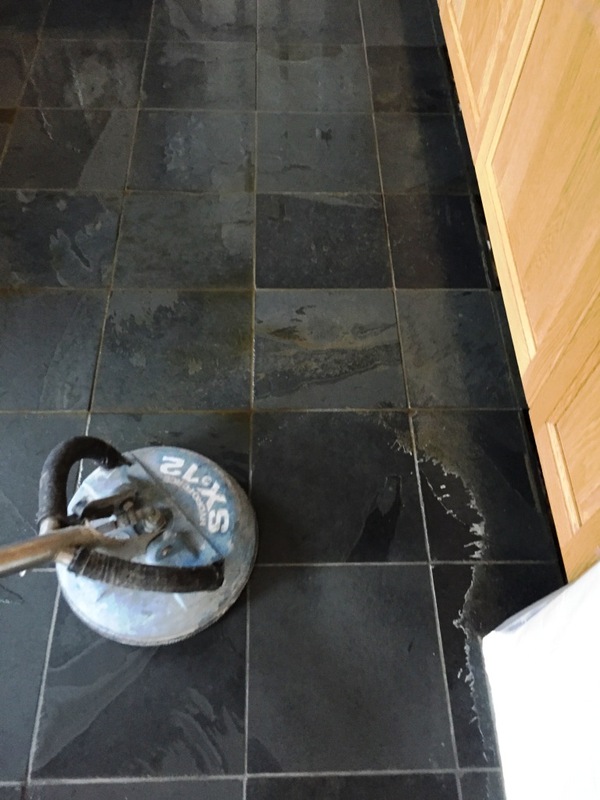 The system works by applying hot water under high pressure to the floor deep cleaning the tile, whilst simultaneously extracting the dirty water back to a tank on our van. 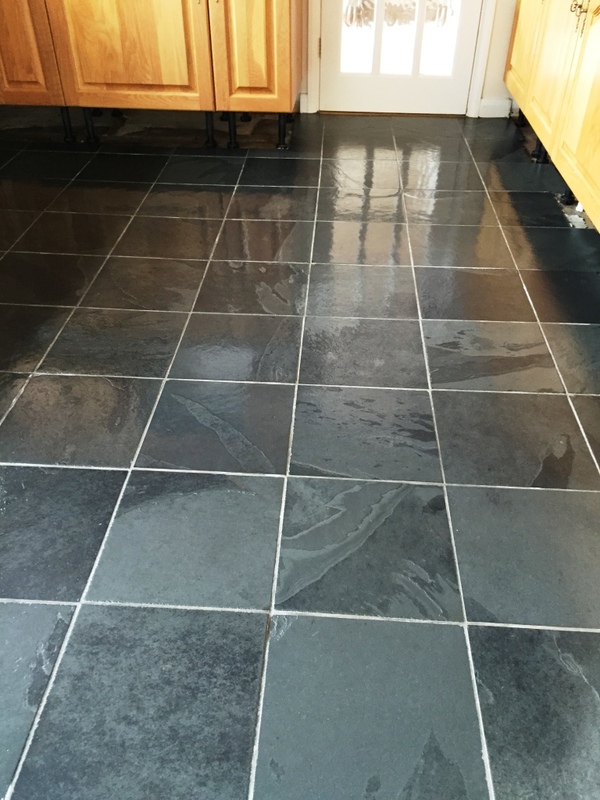 This process did a great job of getting the floor clean and free of old sealers etc., and after completing the initial clean a thorough walk through of the floor was done to identify any stubborn areas that needed further treatment. Finally, the floor was left to dry overnight. 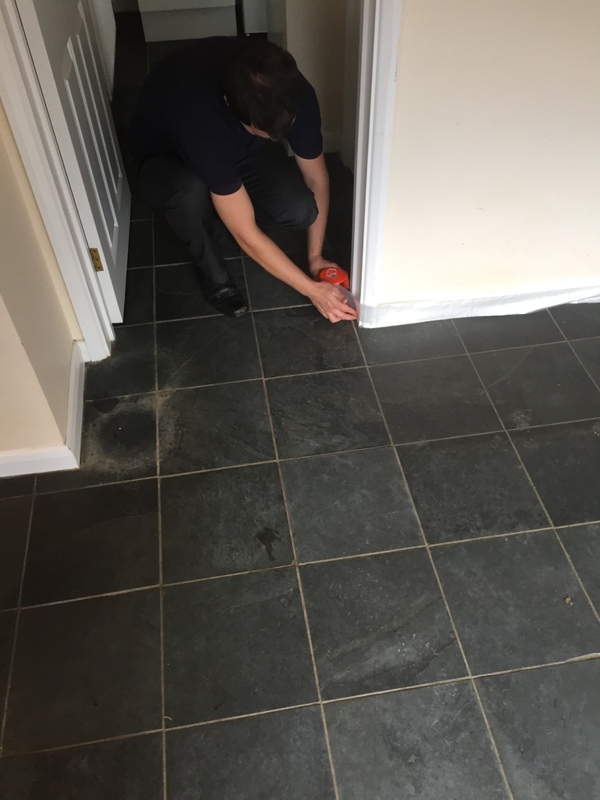 Upon arriving back at the property, the next day, I ran some quick damp tests to check that the floor was completely dry and ready to be sealed. Once satisfied, I applied several coats of Tile Doctor Seal and Go, which works really well on Slate giving it that much needed protection against dirt and stains, along with a full lustre finish that enhances the character of the floor, it was a large area and you have to wait for the first coat to dry before applying the next so it took some time to complete as I’m sure you can imagine. 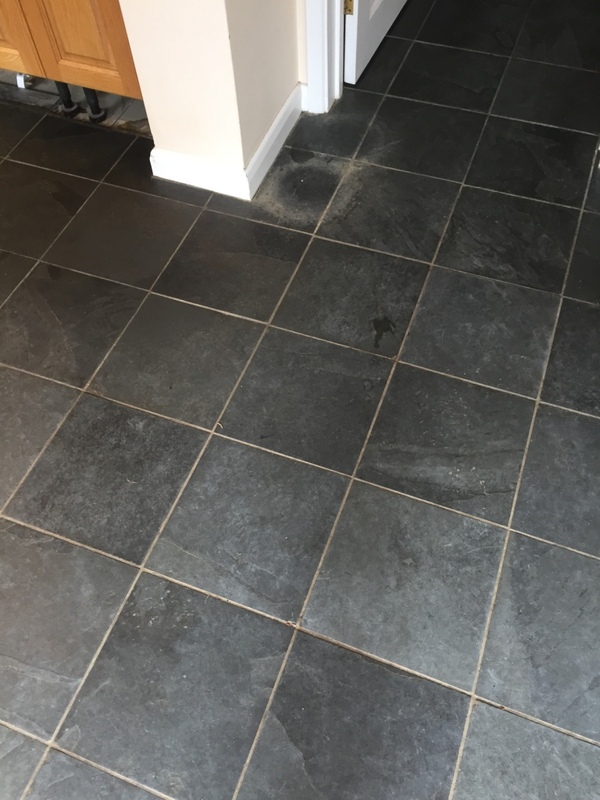 You should be able to see the floor was quite transformed after our visit and needless to say the customer was very happy with the result. 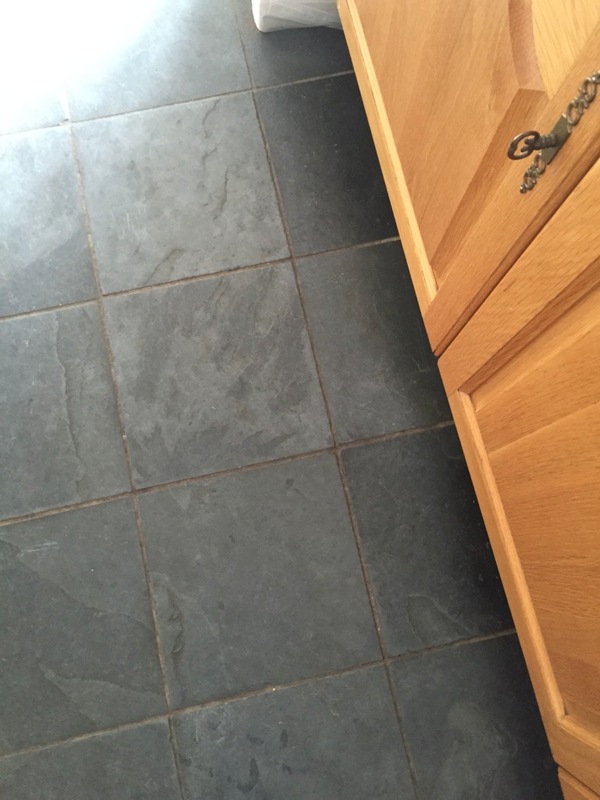 This entry was posted in Slate Tile Posts and tagged cambridge, dining room, duxford, kitchen, slate tiles, tile cleaning, tile sealing, toilet, utility room by AbzDominise. Bookmark the permalink.